Crude oil transit by pipelines via Ukraine to Europe in January 2019 grew by 5%, or 52,000 tonnes, year-over-year, to 1.097 million tonnes, JSC Ukrtransnafta has said. 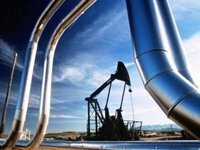 Crude oil supplies to Ukraine's oil refineries in January 2019 totaled 162,400 tonnes, which was 6.7%, or 11,600 tonnes, down year-over-year, according to Interfax-Ukraine's estimates. Thus, transit shipments accounted for 87.1% of total crude oil supplies in January 2019. The share of crude oil supplies to the refineries was 12.9%. As was reported, Ukraine saw a 4.3% decline (by 602,400 tonnes) in crude oil transit shipments by pipelines via Ukrainian territory to Europe in 2018, to 13.335 million tonnes.